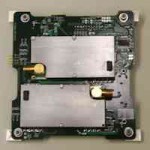 MCubed-2 is a mission designed around flight evaluation of a NASA JPL image processing FPGA called COVE. Our spacecraft provides pictures of Earth for processing, power, and data handling. 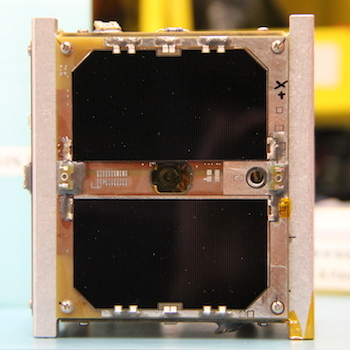 M-Cubed2 is a re-flight of the COVE experiment with updated avionics after the original M-Cubed accidentally docked with another cubesat shortly after launch, losing the ability to transmit in the process. The amateur radio community can take part in the M-Cubed2 mission by tracking the satellite and sending us any received beacons. Beacon parsing and transmission can be handled automatically using our MXL Client Application. This Java application is compatible with any 9600 baud, KISS-enabled TNC and all operating systems that can run Java applications. If the ground station has Internet access, the client will automatically forward the beacons to our database. Not active. Launched and active. MC2 was successfully launched 06 December 2013 and First beacons where received from global HAMS. 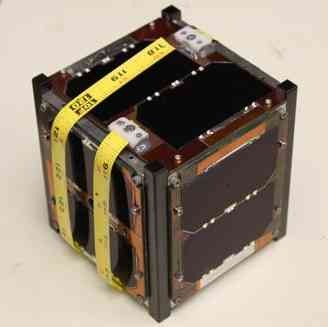 The mission objectives for the Michigan Multipurpose Minisatellite (M-Cubed) is to capture mid-resolution images of the Earth from Low Earth Orbit, perform a technology demonstration for a novel new Field Programmable Gate Array (FPGA), and train the next generation of Aerospace Engineers. Data send and received from onboard M-Cubed to the ground station using a 144 MHz uplink and a 430 MHz downlink, amateur radio bands will be used to control and receive data from the satellite. A basic beacon signal containing satellite health data will be transmitted intermittently throughout operations. Data and commands will be transmitted using the AstroDev Lithium 1 radio. Not active. Launched and active. M-Cubed is scheduled to launch on 28 October 2011 from Vandenberg Air Force Base in California.